**Disclosure: This is a sponsored conversation written by me on behalf of goodnessknows. The opinions and text are all mine. 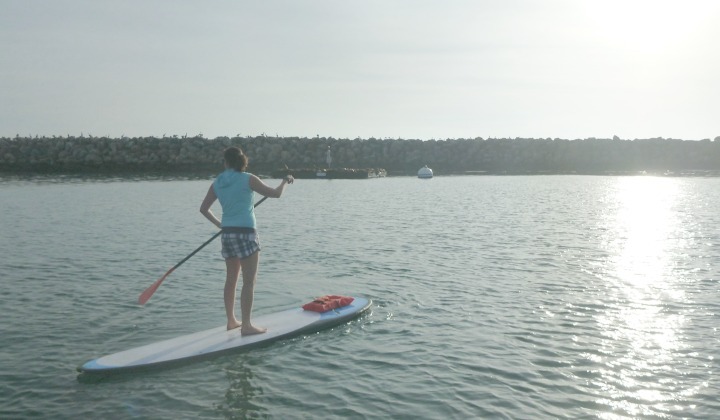 Paddleboarding on a Sunday afternoon – one of the many reasons my summer has been great. Summer is always my favorite time of year. The days are longer, the water is warm, and there are plenty of fun outdoor activities to do. I know many people go back to school this month (August), but I am personally also really looking forward to “local’s summer” which is the period after Labor Day and into October where we get to enjoy great beach weather with less crowds. 1. I won a bike! – You may remember my blog post I wrote about how I won a Public bike from goodnessknows snack squares. I picked it up back in June and it is SO AWESOME. I am obsessed with it. The bike has a cute basket and I’m even contemplating getting a child seat so I can ride around with Baby Awesome in it. 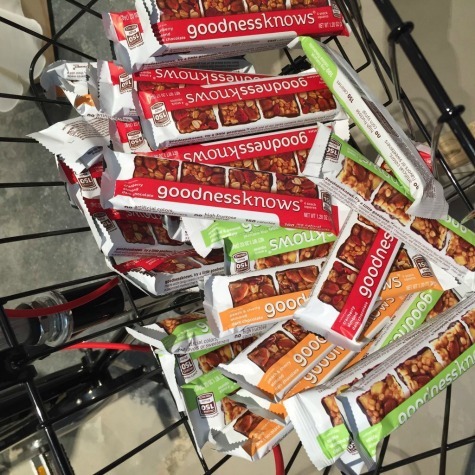 Not only did I get a bike, but I got plenty of goodnessknows snack squares too. So good! 2. I rode the bike I won in the Redondo Beach Triathlon – I picked up my new bike from goodnessknows snack squares on a Friday afternoon. That Sunday, I rode my new bike in the Redondo Beach Triathlon. It was a short race and the bike portion was only a few miles, but it was a blast. I got so many whistles and hollers on the course from people. They all loved my choice of bike styles. Most people were racing with serious road and triathlon bikes, but I think my bike was way better. The bike has gears so it handled the hills like a champ. I am now considering riding it again in the Hermosa Beach triathlon this upcoming October. 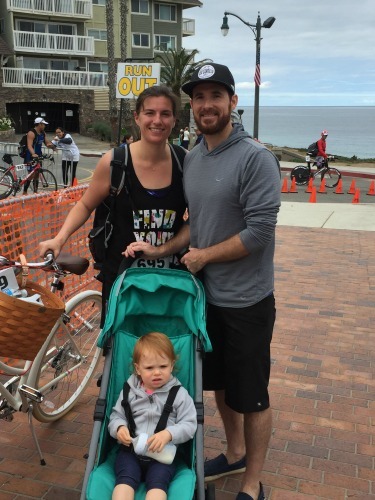 The Redondo Beach Triathlon 2016. 3. Baby Awesome – She is 19 months old now and I just love her so much. She’s at an age where she is learning how to run and she loves the water. Everyday with her is so much fun. It makes me so happy to see how much she loves being in the water like her mom and dad. Now we need to enroll her in swim lessons! We also have enjoyed hanging out indoors in air conditioning so she can enjoy a bit of an escape from the heat. 4. Making Time for Vacations – One thing that I’ve really focused on since becoming self-employed and starting my company, LTM Digital, is to make time for vacations. When I was working in the corporate world I hardly took a day off. Or if I did take time off, I felt guilty or spent most of my day working anyway. Not anymore. My company keeps me very busy which makes it even more important for me to take the time to unplug and relax. Plus I always come back refreshed and recharged with fresh ideas. It’s a win win for everyone. We went to Ohio to visit family over the 4th of July weekend and have a camping trip planned later this summer. I can’t wait! Hanging out in Ohio over the 4th of July weekend. 5. Workouts – It’s taken me longer than I anticipated to get back into a regular workout routine after becoming a mom. It’s so hard to do it all, but I’ve finally got into a groove that I really enjoy. I have been switching up my routine and working out in the morning before work 2x a week. It has helped my moods and keeps me feeling good and energized through the day. I am not really a morning person but I look forward to the days I get to spend jumping in the pool and starting off my day with a swim workout. I’ve also had some fun opportunities to try different fun workouts around town like Pound Fit and Kickboxing. My husband and I have even gone on “day dates” paddleboarding which has been super fun. Having a sweet new bike to ride around our neighborhood hasn’t hurt either! We may be in August but it’s still Summer in my mind until late September / early October. I am going to keep enjoying quality family time with my husband and Baby Awesome and continue to enjoy outdoor fun and my sweet new bike from goodnessknows. What about you? How have you taken your summer from good to great? Post in the comments and let me know! 12 Days of Fitness: Day 4 - Plank It! My summer has been all about flexibility (and continued patience) with my training. I noticed the early signs of Plantar Fasciitis around Memorial Day….luckily, I caught it early, so I knew immediately to scale back the mileage and take things easy (I had a couple of half marathons a few weeks later and an ultra marathon in July…and I did not want to miss any of them). Although my finish times weren’t PR’s, I was able to do all of my races (but did have my first-ever DNF a week prior to my ultra). Alas, the ultra went well, and now I’m gearing up for 26.2 training to begin soon for Route 66. Onward!! aw, what a great post! I think it’s so important to take time to have some fun and just enjoy life. Your little is adorable. I became self-employed over the past year as well and while tough at times, I love the flexibility it has given me. Lucky you! I love that you did a triathlon on your new bike. So cool! what a nice post! 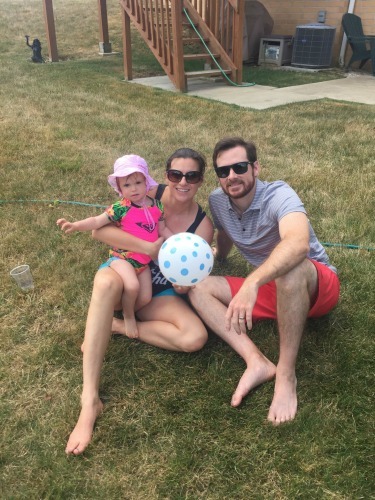 Summer time and extra family time is the best, take those days off when you can , you never know! Cool bike 🙂 have fun! Sounds like you’re having an awesome summer. As a teacher and a new mom, I’ve thoroughly enjoying being able to spend the summer at home with my little man. He’s grown so much since the end of the school year, and its been incredible to witness his developments by being able to spend more time with him than I get to during the school year. Your summer sounds pretty darn awesome! 🙂 So jealous of the paddle boarding and your bike makes me miss the beach cruiser with a basket and bell I had in San Diego when we lived there! Keep on keeping on! Awe this sounds so lovely! I do love a good day date with the hubs – it can be easier to find people around to watch the little one. It’s also super exciting to win ANYTHING – let alone a bike! Good for you and your tri! I’m not much of a swimmer…or cyclist…but a tri is definitely on my bucket list! Summer is time you should make a picnic with your family and your kids. There are many awsome places to go.Especilly , there are many outdoors activities that you can take part.